I didn't think I could do this! Whatever we want most, that we achieve. While that isn’t 100% accurate of everything in life, with that attitude people have accomplished things that no one ever thought possible. What we dwell on, what we think on, what we imagine, this becomes a reality. It all starts in our mind. The amazing feats of man kind, the hundreds of feet high sky scrapers that rage against the blue horizon. The inventions that have come to be a part of our every day lives, all of these started somewhere, in someone’s mind. They imagined it. They put energy and thought into it and it became a reality. It truly is amazing what we can do with our minds, which is why it’s so important what we think about and let our thoughts wonder to. Guard the mind like it’s a valuable treasure, for truly, it is essential to our being and life. It’s been three years since I started this farming adventure. It’s quite funny to think about how I thought about things regarding farming and business back then. What started out as just an idea has turned into so much more. I thought we’d grow a few vegetables and have a CSA and make some money and go home at the end of the day and say we farmed. It’s turned into so much more than that. I quickly realized that it’s easier for one guy to raise animals, than one guy to raise an acre or two of vegetables. I also found meat and eggs to be a more stable shelf product and something that is one step above throwing seeds in the ground. Making it slightly harder for competition to get into it. I found out last year that in order to be a direct-to-consumer farm you’re gonna need a big brand out there and that requires many things. I quickly realized that I needed to be engaging and putting thought into social media as well as blogposts and networking. What started out as a journey to the outdoors had me quickly turn around and spending hours on my laptop. It’s funny how that happens. I had no interest in being good at marketing, selling, branding, or social media engagement. And yet, I was willing. I was always willing to do what it took. I think more than anything that’s what it takes. Are you willing to do what it takes to get there? Just last night I was about to go to bed at 10pm and it was pouring down rain, nasty wet outside. I remembered I had to check on my broiler meat chickens who are just over 3 weeks old. They were standing in 1-2” of water in the pasture and shivering. So I got down on my hands an knees, down in the mud, the poop, and old hay and got it spread out over the bottom of the pen and one by one picked up 97 broiler chicks and put them on dry ground. It only took me 20 minutes but by the end I was completely soaked through, poop all over arms and legs and completely ready to go to bed. That is just an example of me being willing to do what it takes. I’ve always been a bit of a self-learner. If I wanted or had the drive to learn something I researched it, read books, watched videos until I could do it. Same with farming. What will it take me to make a living off of it? What kind of branding do I need to do, what kind of networking, social media, what kind of ground work in order to make sure healthy animals turn into healthy meat. The farm is on it’s way up. Having been around for this long, we’re starting to get some traction with people recognizing us and people talking about us. Through being at farmers markets, farm to table dinners, delivering eggs to our customers and restaurants, through blogging, through instagram, facebook, teaching at schools, news interviews with local news papers, it’s all just a platform. It’s all the cumulative of what it takes. It takes consistency with showing up, consistency with quality product. We’re maxed out on egg production and are adding another 150 hens into production by August and 400-500 by next spring. 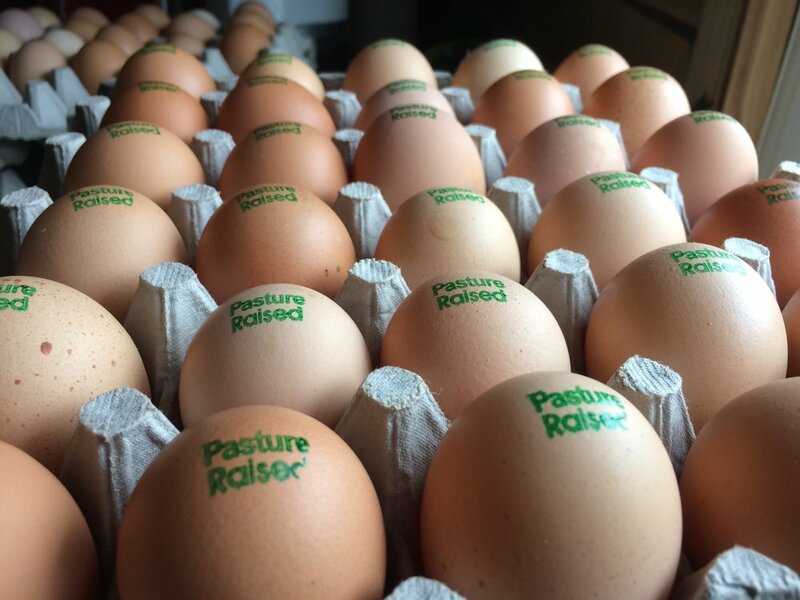 Eggs are not a big money maker, but they do make a little bit, and they help with cash flow and economies of scale with ordering feed and everything else. Chicken is sold out. We’re really gaining traction and selling more and more birds. Teaming up with Pasture Plate, Steve Cagle with pastured poultry has been a big help. Not only support and hands on help, but another market to sell to. Our Farm to Table dinners just started but with such limited seats I don’t think we’ll have any problem filling them up. They’re really picking up speed because almost no farm does dinners like we do. They’re a lot of work and take skill or money to hire out cooking the meal. The high tunnel is such a pleasure to work in, especially when it’s raining outside and you’re not getting wet inside! With the more visibility we have and restaurant accounts I think I can sell every tomato I can produce out of it. We have plans to build another next year, mainly because we’ll need a place to house our layer flock through the winter months. 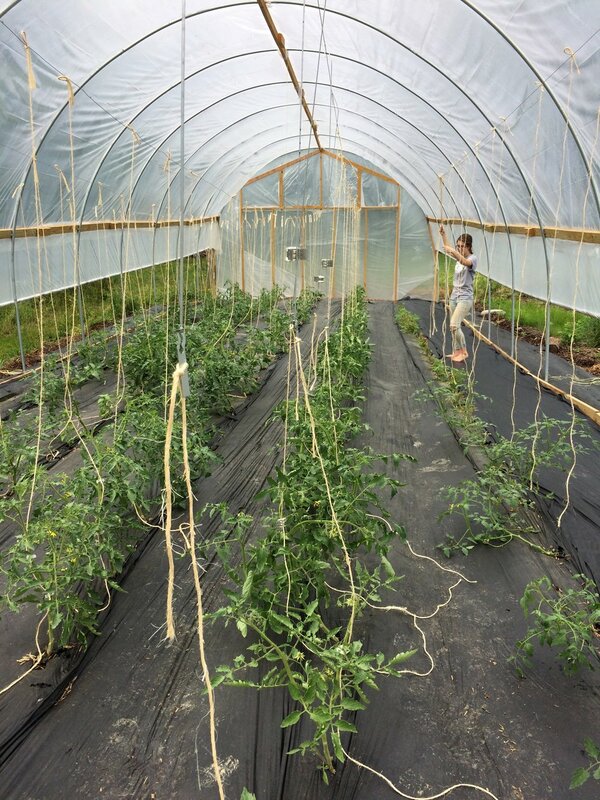 But having more growing space in a high tunnel offers a lot of potential for expanding tomatoes or other high profit crops. It’s hard to believe that in January I couldn’t see a good direction for the farm. Coming off vacation and the cold dreary days of winter combined with ending last year with sever burn out I didn’t have hope, and didn’t have a vision. I was going to stick with things for now because, that’s what I do, even if I don’t feel it, I am committed to my commitments. What changed? Several things changed. I started emailing with old friends who I first interned at Rocklands Farm with, Joel and Megan. We talked about farming and bounced ideas off each other and than they sent me a video of Ridgedale Permaculture. I started watching Ridgedale Permaculture farm with Richard Perkins in Sweden and for the first time I watched a farm doing permaculture and being real and doing business and making money from the crops and livestock they raised. I’d about given up on the idea that sustainable farming was worth it. Ridgedale emulated everything I wanted in a farm and I ended up watching every video Richard had made 180+ at the time (average length 15+ min) and I got inspired once again. They have chickens, egg layers, pigs, a big no till market garden, a pond, and fruit trees. But Richard was so pragmatic and down to earth. At the end of the day, when all you're ideals and ideas are floating around you have to make a profit. And they are, they are doing an awesome job of farming in Sweden and I still keep up with him, it’s my weekly highlight! Steve Cagle came along, we’d talked briefly in November and kept up just a little through the holidays. We met up in late January and started talking, running ideas and just playing off things that came to mind with each other. We soon found ourselves in a position to be able to produce pastured chicken and sell to his customer base and mine and it’s kind of exploded since then. We keep getting more and more traffic and people asking about our product. Spring arrived. Warmer weather thawing winters heart. I attended a farm conference. I ran spread sheets of enterprises and saw profit numbers that might be attainable. I started listening to podcasts on farming again and pastured livestock. Egg sales continued to take off. We got accepted at Main St Farmers Market. Things just kept progressing. Sometime in March I decided I wanted to up the farm’s instagram game. Did some research, decided to put the time and effort to take and edit better quality photos, and spend more time with captions and engaging and being thoughtful and educational in the content I posted. We’ve come close to doubling our followers (we’re still really small, only 250+ followers) since beginning of the year. After that I decided to get cross traffic from local businesses by promoting them, telling their story on my farm blog. It was a win win (like how real business should be!). They got traffic, I got traffic and we both benefited from it. I can finally see the light at the end of the tunnel. Entrepreneurs say when you put in 10,000 hours you finally have something—and by my calculations I’m at about 15,000 hours, I guess we’re finally getting somewhere! It’s exciting to see dreams finally coming true. We still have small loans, debt that we took on to buy animals and seed and materials. We’ve made mistakes, and continue to make them, costing money and energy, but we’re going somewhere. There’s no longer a question of if we’ll make it, but rather when. We still have a lot of growing and consistency and work to do, but we’re finally going somewhere! The next thing is to start a better record of our farming via our youtube channel. Posting farm updates as well as how to videos on farming and cooking. And we wouldn’t be here without all of you. Family, friends, our customers. 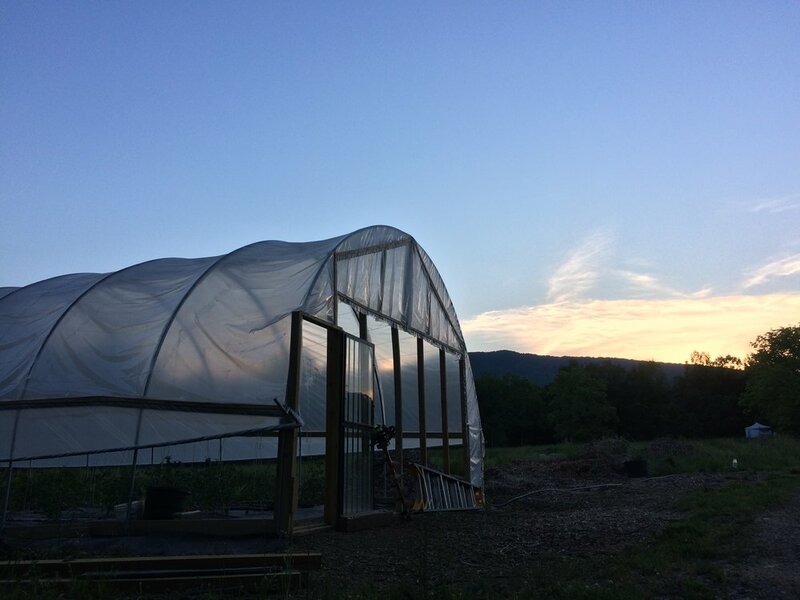 People who bought our first CSA shares, the ones who were with us from the beginning and continue to stick with us. It takes a village to make a small business work, and we’re so excited to be doing it with all you! Older PostMore than just a smoothie!